Bettas are famous because of the aggression of the males, who will fight and kill rivals. This has led to them being kept as fighters for human entertainment. Male bettas can also be aggressive towards fish of other species with red or blue colouration, but otherwise they (and the modest brown-coloured females) are actually quite peaceful, agreeable tropical fish capable of enjoying company. However, because they have long fins, you should be wary of housing them with fish like angel fish and rasboras who are likely to nip them. Bettas are naturally carnivorous, though in captivity they may also enjoy a small amount of vegetable matter, such as peas. They do best on a diet of live food, but will also accept flakes. Siamese fighting fish possess a specialised breathing organ called the labyrinth organ. This enables them to consume air very efficiently, enabling them to survive in the wild in small pools which heat up until there is little available oxygen in the water. For this reason it is normal for them to gasp at the surface in the aquarium, and this behaviour shouldn't worry you as it would with other fish. Whatever you keep them in, it's important to make sure that your bettas have access to the surface so that they can breathe properly. Over the past few years a fashion has developed for selling male Siamese fighting fish singly in very small bowls or even in flower vases. This is not a suitable environment for a fish. Bettas need quite warm water and the smaller their environment, the more difficult it is to control the temperature. It is also harder to maintain a proper ecosystem and keep water pollution under control. Furthermore, although they are less active than many kinds of fish, they still need room to swim about in order to be happy and healthy. Bettas can be happy living singly. If you choose to keep your fish like this, in a small aquarium, make sure that the fish tank is out of direct sunlight in order to reduce its vulnerability to uncontrolled temperature changes. 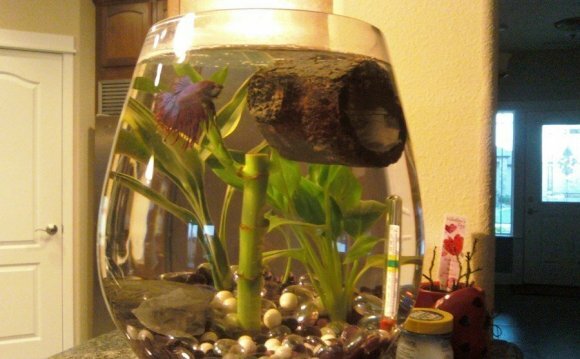 Bettas can be housed with other fish under certain circumstances. You should research the behavior and requirements of each species before you add them to your tank. Male bettas are territorial and should never be housed together under any circumstances. They’re called Siamese Fighting Fish for a reason. Additionally, males and females also should not be housed together unless you are planning to spawn them, which should never be attempted by novice aquarists. Female bettas can be housed together in groups of three or more. (Odd numbers are preferable) When housing two females together, one tends to claim dominance and bully the other. Grouping three will allow them to establish a hierarchy. Keep in mind that all bettas have a strong individual personality. Any one betta may be overly aggressive and may have to be removed from a community tank. Be prepared to take a betta out and have a tank he/she can be placed in if he can’t play nice with others. Bettas can do great with other community fish. There are hundreds of commonly kept freshwater aquarium fish so I won’t go into which are good and which are bad, but here are some general rules of thumb. 1. Don’t place bettas with other brightly colored fish or fish with large flashy fins like guppies or mollies. They occasionally react to them as though they are another betta and sometimes show aggression toward those fish. 2. Don’t place bettas with other Anabantidae fish such as Gouramis. Anabantidaes are fish that possess a labyrinth organ allowing them to breathe air from the water’s surface when dissolved oxygen levels are low. Because they are close cousins, bettas generally will be aggressive to these fish as well. 3. Don’t place bettas with other aggressive fish or fin nippy fish. Nipped betta fins can become infected or generally stress out your betta leaving him open to other ailments.